Welcome to the worlds greatest guide to Women's Fleece Long Sleeved Zip Sports Shirt. Are you actually looking for Women's Fleece Long Sleeved Zip Sports Shirt? Well, we hope you are because the reality is that you have found our Women's Fleece Long Sleeved Zip Sports Shirt page. 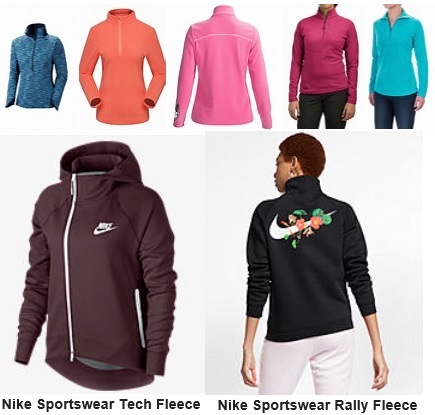 In this women's clothing section of the Apparel Search directory, you will find all sorts of interesting information regarding Women's Fleece Long Sleeved Zip Sports Shirt. Apparel Search is a leading guide to fashion, style, clothing, glam and all things relevant to apparel. We hope that you find this Women's Fleece Long Sleeved Zip Sports Shirt page to be helpful. What is a women's sports shirt? A sports shirt is a a casual top for sports or informal wear. Essentially, it is a casual top or one designed for athletics. Keep warm in women's fleece tops from your favorite fashion retailers. Women's sports shirts help you achieve that unmistakably relaxed look while maintaining a classic sense of style. Because they are for casual occasions, women's sport shirts get away with a great deal of flexibility with design. Patterns can be bigger, brighter and bolder. They can be with or without pockets. They can also be basic solid colors, like black, white, blue, red, etc. The women's fashion market has a wide variety of sport shirt options. Women's fleece long sleeved zip sports shirts are simply one of the many options for this fabulous fabric. Fleece is NOT just the woolly covering of a sheep or goat. Fleece fabric is made from synthetic fiber. This material is generally very soft. It is can be manufactured from recycled plastic bottles or synthetic fibers, such as polyethylene . The fleece fabric is generally lightweight yet breathable, which means air can flow through it easily. Learn more about breathable fabrics. The polar fleece or also known simply as fleece is a synthetically made fabric from polyethylene terephthalate (PET). A lightweight, warm and soft fabric, fleece has some of wool's good qualities but weighs a fraction of the lightest available woolens. Polar fleece garments traditionally come in different thicknesses: micro, 100, 200, and 300, with 300 being the thickest and least flexible. Polar fleece is a soft napped insulating fabric made from polyester. Polar fleece originated in Massachusetts in 1979 when Malden Mills, (now Polartec LLC), and Patagonia developed Synchilla (synthetic chinchilla). It was a new, light, strong pile fabric meant to mimic, and in some ways surpass, wool. Company CEO Aaron Feuerstein intentionally declined to patent polar fleece, allowing the material to be produced cheaply and widely by many vendors, leading to the material's quick and wide acceptance. What ever type of fleece clothing you are wearing is in fashion. If you want to be even more stylish, you should wear your favorite Women's Fleece Long Sleeved Zip Sports Shirt.